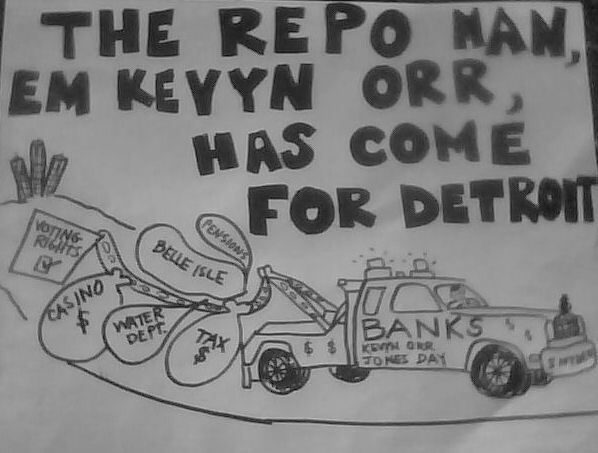 IT FINALLY COMES OUT: Elite Traders Are Getting Access To Data Before Everyone Else » Cancel Detroit’s Debt To The Banks! After some digging CNBC’s Eamon Javers reported that the source of the early trading was Thomson Reuters. The company has a well-known deal with the University of Michigan, the source of the data, that allows Thomson Reuters to release that data 5 minutes before it’s supposed to come out (9:55 am) to clients who pay for that privilege. But Thomson Reuters also provides a service called “ultra-low latency,” which allows premium customers to get numbers like Consumer Confidence and the Institute for Supply Management’s manufacturing index number 2 seconds before it’s released to the general public for $2,000 a month. Two seconds in high-frequency trading time is an eternity. 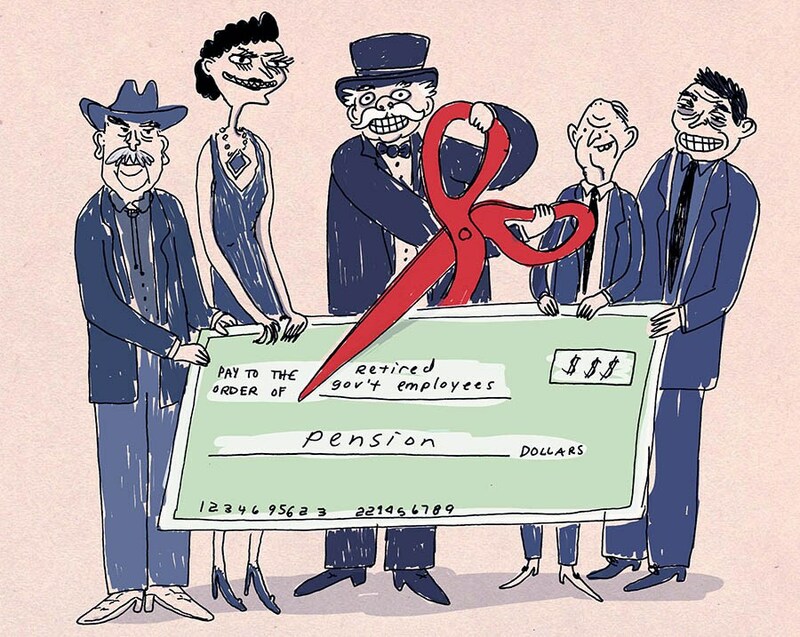 The University of Michigan responded to this by saying, essentially, “we do it because people pay for it. Richard Curtin, an economist who runs the university’s survey, said he knows the deal gives an advantage to select investors. Before we put on our self-righteous anger hats and ride over to Thomson Reuters pitchforks in hand, let’s be real. They aren’t the only ones doing this. To get the ISM number early, you also have to pay a $1,025 fee if you don’t have a high-speed connection to exchanges, according to The WSJ. Again, that’s if you don’t already have one. See, exchanges have their own form of latency. While Thomson Reuters is assisting firms trading on news (a strategy called “event jumping” and/or “news feed trades”), exchanges have admitted to allowing latency based on when they send out trade confirmations and how technologically advanced and connected a firm is to the exchange. Traders have a bunch of strategies for how to take advantage of this information, but it’s really all the same thing — some people have information before other people. Not because they’re smart, but because they pay for that privilege. CNBC’s John Carney compared that to the “expert networks” under major scrutiny by regulators and the infamous Goldman Sachs “trading huddles,” in which research analysts met to pass tips on to traders and favored clients, and for which Goldman was fined tens of millions of dollars. Chilton: What that means is that two seconds. Sorkin: This is the Consumer Confidence survey? Chilton: Right. That two seconds can impact markets a lot. These are millisecond markets, and two seconds is huge for them. Sorkin: So my position on this is actually I’m not that bothered by this. I look at the news industry and I say if you want to get Bloomberg News, for example, you have to have a terminal, that’s $20,000. You can get this news on the website, but you’ll get it later. If you have a Dow Jones terminal, you can get access to Wall Street Journal’s stories in advance. All of those things cost money and they are premium tiers for this information. So I’m unclear why we decided this information is somehow more valuable or a public good than other news organizations. Put news organizations aside. Dana Telsey who is an analyst in the retail business — she does a survey. She is constantly surveying retailers. If you pay for the research you get the research. If you don’t pay for it, you don’t get it. Tausche: Bloomberg News owns Bloomberg News stories. This is Thomson Reuters taking third-party information. Sorkin: This is buying it the same way if I were to hire five reporters to go do the survey. I’m hiring the University of Michigan to go do the survey. It’s the same thing. Chilton: Keep in mind what you’re saying … and look, it’s a debate. And we’re gonna do a concept release on a bunch of these technology issues in a month or so. And I’ll be talking about it in a week, with regard to our fine furry friend the cheetahs. But, it’s all about money. Right? So, if you have the money to afford these extra services — if you can have five reporters, if you can have a supercomputer and do high speed trading, yeah, you can be in the markets. Is that really where we wanna go, Andrew? That you have to have the money, that you have to have the best, fastest computers? So that’s the question here — do we want the market to be a meritocracy or do we want to surrender it to the robots — actually not even the robots, the people who can pay for them. Bloomberg News editor Matt Winkler sent a letter to the University of Michigan arguing that, while there are no specific regulations about latency, it seems to be a violation of a more general SEC rule, Regulation FD. This doesn’t contribute to a fully informed market as required by the U.S. Securities and Exchange Commission’s Selective Disclosure and Insider Trading Rule. Regulation FD, as it is called, was approved by the SEC in August 2000 partly in response to reporting by Bloomberg News that showed the wide prevalence of selective disclosure of material information. And for all the cynics out there — yes, there have always been ways for people to pay to game the market. But there are regulations for them. That’s the difference here. We have to strive to be better, for now, in this case we’re not even trying. 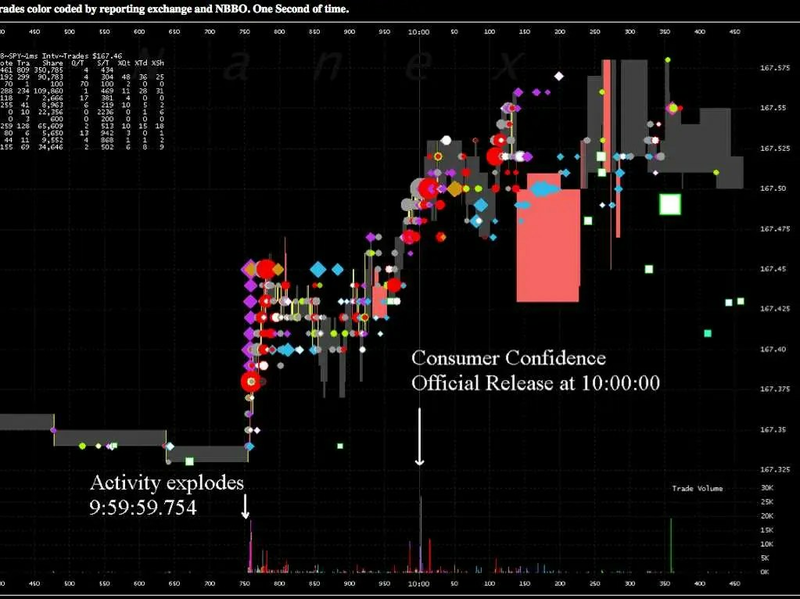 You can check out how crazy trading gets ahead of important news (in this case Consumer Confidence) in the video below, provided by Nanex.